Argentina's president has announced plans for a debt swap to try to avoid a US court ruling that pushed Argentina into a second default. 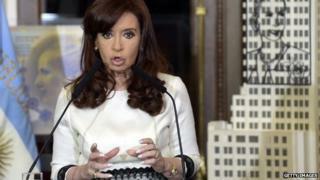 An emotional Cristina Fernandez de Kirchner proposed legislation that would return control of its debt to the government. "Excuse me if I get a little nervous, I usually have more poise," she said. A New York court last month blocked an interest payment to bondholders as a result of a row with US investors. The $539m payment was for bonds, issued under US legislation, that were restructured following Argentina's default in 2002. A US judge ruled that a deal must first be struck with a group of hedge funds that had rejected the restructuring deal and wanted full payment - known as "hold-outs". The draft legislation would replace Bank of New York Mellon as the bondholders' trustee with state-run Banco Nacion, which would enable Argentina to pay the interest owed to the majority of bondholders who agreed to the deal. Bank of New York Mellon has been forbidden from transferring funds. Ms de Kirchner has refused to give in to the "hold-outs" demanding full payment and said the new voluntary deal would be in line with the terms of agreements made in 2005 and 2010. More than 90% of creditors agreed to accept large losses at the time. "If bondholders decide - in individual or collective form - to ask for a change of the legislation and jurisdiction of their bonds ... the economy ministry is authorised to implement a swap for new public bonds under local legislation," Ms de Kirchner added. "I really feel we are living a moment of great injustice in Argentina." However, analysts said the move dashed hopes that Argentina could strike a deal with the hedge funds demanding full payment and allow the country to move out of default and return to global capital markets. It was also unclear whether Argentina could sidestep the US court's ruling. Alejo Costa, strategy chief at investment bank Puente in Buenos Aires, said: "Argentina could end up in contempt." There are also fears that dragging out the debt crisis could worsen Argentina's recession and further weaken the peso.